Clowns to protest NATO summit in Chicago. No, really! You are at:Home»Afghanistan»Clowns to protest NATO summit in Chicago. No, really! Ladies and gentlemen, clowns will descend on Chicago this weekend. Let the nightmares begin! Top political figures and military officials from across the world will be in the city this weekend for the 2012 NATO Summit, and the war in Afghanistan figures to be the top topic. It’s the kind of event that draws protesters as commonly as a Justin Bieber concert draws screaming teenage girls. Clown Bloq is a collection of clowns and clownfinity groups that organize together for a particular action. The flavor of the Clown Bloq changes from action to action but the main goals are to provide hilarity in the face of a humorless police state and to provide a fool’s critique of organized and militarized repression of the people, their voices and their best interests. 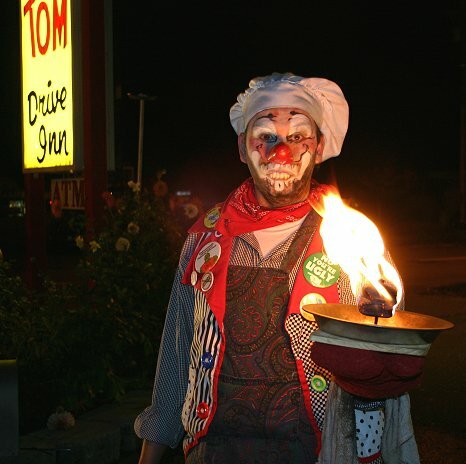 Clown Bloq’s intention is to be both disarming and tactically militant. We are trained in traditional forms of hard blocks, soft blocks, de-arrest techniques as well as other historically significant tactics. It must be consistently reiterated that Clown Bloq is both a joke and NOT a joke. Both a joke and NOT a joke? Therein lies the rub. Clown Bloq is affiliated with the Occupy movement that first gained traction on Wall Street, and is attempting to poke fun at NATO even as its members have thousands of service members deployed to fight the Taliban. That’s not going to go over well with everyone, to be certain. Last time I checked, the war in Afghanistan was no laughing matter. Clown Bloq leaders have said in previous interviews that clowns have been used in protest before at events like the G20, but their apparent level of organization here is striking. Their interaction on social media sites like Twitter is impressive, their websites are robust, and they’ll draw attention simply through the novelty of their act. Yep, it’s going to be one of those weekends. HONK HONK. Watch out the the Joker may attack ANTO forces call Batman!! Only clowns I see at this call themselves Politicians.